Homeowners who are strapped underneath some credit card, student loan, and/or car debt can choose to refinance and consolidate their payments. Understanding the basics of this financial strategy may be the first step in considering such a move. Regardless of the loan type (FHA, VA, FHLMC, FNMA, USDA) cash-out refinances are possible, the guidelines and requirements for these types of loans are stringent, as any mortgage loan process tends to be. Judy and John purchased their home in 2001 for $200,000.00. They provided a nominal down payment, but after 14 years they built a fairly respectable equity position. In other words, their home appreciated in value as they paid down the mortgage. They only owe $150,000.00 and they believe that their home is worth $285,000.00 in today’s market. In table 1, we consider the equity position that John and Judy have in their home. This means that Judy and John have a built-in savings account in the value of their home. Its nice to be in such a position. Now, how can it be used to their benefit? Over the years Judy and John have paid portions of several college tuitions and accumulated credit card, student loan, and car debt as indicated in table 2. Judy and John have credit scores just above 620, they’ve had steady jobs for the last year, and have two late payments in the last twelve months. Overall, their credit could be better, and if it was better, they would stand a chance at saving more money than our scenario describes. They were never behind on payments, just careless about sending the payment on time. Busy people! 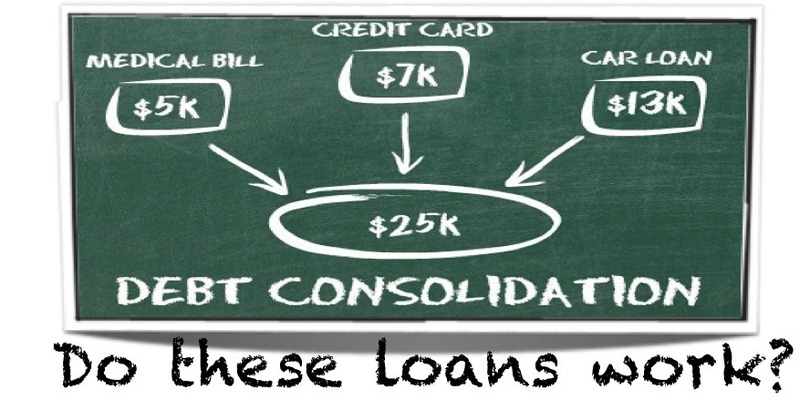 So, how does a debt consolidation refinance benefit John and Judy? Well, they are currently on a loan that has a 5.25% interest rate. Not bad! In order to stay on a fairly ‘close’ schedule of their original 30-year plan they will choose to take on a 20-year mortgage. They agreed to a 3.625%, 20-year loan tying-in the new $67,000 in debt. 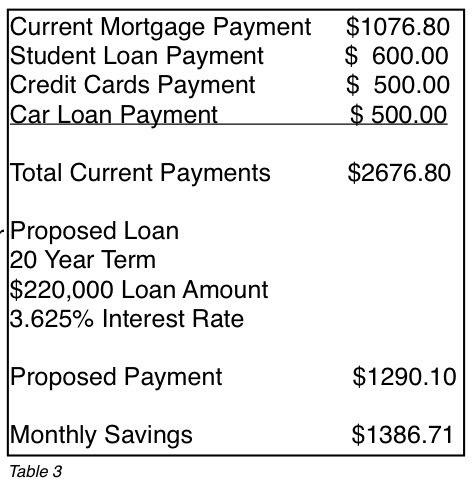 As Table 3 describes, John and Judy currently have monthly payments of $2676.80. With their proposed monthly payments, John and Judy are able to save $1386.71. Awesome savings! Imagine if they would be disciplined enough to put that towards the mortgage payment each month? If they did, they would pay it off in 7.9 years! Wow! It might be tough to keep up with that payment, but they were doing it all along anyway! Judy & John are now able to write off the interest on all of the debt, save a bunch of money each month, and have the option to pay off their mortgage in shorter time, if they so choose. For them, it is all about cash flow. They need to save on their monthly expenses in order for them to be able to save for retirement and for their standard, domestic necessities. Sometimes it seems like starting all over again may not be the best long term financial strategy. In this example monthly cash flow was the key motivator. Most typical American families experience a cash flow crunch at some point in their lives. Hopefully, Judy and John can build-up some reserves in their accounts, then begin to apply the majority of the monthly savings toward the mortgage balance. They are nearing retirement and are currently on a 10-year plan. Now that they only have one payment their future goals seem much easier to attain. Wish them luck!